On December 15, 2018, authorities in Hampton, Virginia say that 23-year old Iquan Malik McClain was shot to death in the parking lot of a Family Dollar store. Breshard Turner and an accomplice, 23-year old Rashad Lamont Langley are the alleged suspects in the case. The motive is not clear, but Rashad was reportedly charged with shoplifting as well. Breshard is still a fugitive. Based on crime location, it is advised to contact the Hampton Police Division at 757-727-6111 if you have any information on Breshard Renard Turner's whereabouts. Thoughts? 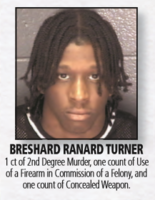 As of today, January 16, 2019, it appears that Breshard is still a fugitive since he was profiled on the January 10th addition of Newport News/Hampton's Most Wanted.